There is a certain appeal that pavers add to a home. The rich color blends and textures of pavers make them warm and elegant. The independent pieces allow for swooping curves, flattering borders and creative designs that no other material will provide. Engineered for performance, pavers are made from an array materials such as concrete, clay and stone. They are durable, strong and long lasting. Being segmental, repairs are easy and seamless. The various sizes create countless paver patterns that produce interesting paver designs, allowing you to distinguish areas on your paver patio. The ideas are endless! All Images and Content Copyright Schneider's Lawncare and Landscaping | Pavers, Cincinnati & Dayton. All rights reserved. 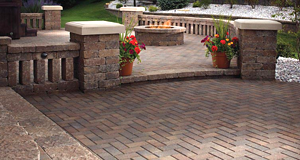 Paver Patios ~ Designed around your Outdoor Living style! Paver Driveways ~ Make Your Car Jealous! ​If your patio project requires a more personal touch, our experienced design team will get your attention with a custom drawn outdoor living space tailored to your style and taste. Like our pre-priced paver patios, our custom patio designs are also created in 3D so there is absolutely no guessing what your new patio will look like. Regardless the size of your paver patio project, large or small, you have the assurance that it will be done right. All of our paver patio installations include a minimum 6" crushed limestone base to keep your paver patio from settling and polymeric joint sand to keep your patio weed free. The size of your budget is not important to us. What is important is that you are looking for a quality project. Note: Schneider's Lawn Care and Landscaping does not provide free custom landscape or patio designs. We would be more than happy of discuss your project and offer suggestions at no charge. However, there is a design fee if you would like to have your project sketched or drawn for presentation. 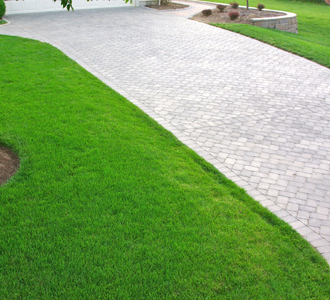 The decision to install paver driveway is one you'll never regret. Known for their durability, a paver driveway installed by Schneider's will not only add value to your home, but you and your guest will never enter your home the same way again. The design possibilities are endless! The borders, the patterns, the colors will forever make your home beautiful and the envy of your neighborhood. ​The process is quite simple. After a brief consultation, our designers will come up with a design that will yield a warm, elegant and inviting entrance to your home. The remaining project belongs to our certified paver installer who will inconvenience you the least as possible. To assure your paver driveway will last a lifetime, Schneider's experienced paver team will use methods and procedures that exceed the industry standards. For example, we use a geotextile under the gravel base to help strengthen the soil plus we install 15" of compacted limestone base instead of 10-12". We only use the proper edge restraints and will only use the highest standard of pavers that are rated to handle vehicular traffic. ​To sum it up, a paver driveway by Schneider's is strong, beautiful and last a lifetime. ​​Paver patios are unique in that the most basic design will make your rear patio warm and inviting. Add creativity and experience to the mix and your paver patio can be transformed into a back yard get-away. 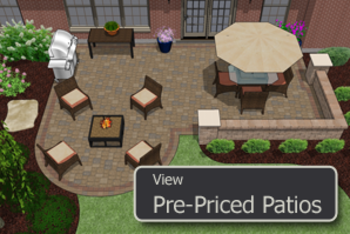 With Schneider's, choosing a patio design that aligns with your budget has never been easier. We offer pre-priced paver patio and hardscape accessory designs for you to choose from ranging from basic to patios with outdoor rooms that feature pergolas, grill stations, outdoor bars, fire pits and elegant outdoor fireplaces. Each one has been beautifully drawn in 3D and include lots of landscaping ideas to make your paver patio project perfect! To make things even more convenient, we have included a price for material and installation guaranteeing your shopping experience for a paver patio simple and easy.